once the calendar hits May, one thing is on their mind when they are in search of catching bass and that is vegetation, specifically the new lily pads that grow in many lakes and rivers. There are several reasons that lily pads play such a key role in bass habitat, the first is that they provide bass with cover, both from the sunlight shining into the water, and also it provides them with an ambush point to feed, which leads into my second point. can develop in many places on your favorite lake or river. Pads can also develop in numerous backwater lakes and sloughs on rivers. On lakes, pads will start to pop up in shallow bays and shallow flats, the depth of water that lily pads grow in ranges, but I like to look for areas that have deeper water nearby. to look and identify these key characteristics. First, I like to idle by the areas I want to fish and use the Side Imaging on Humminbird Helix 10 unit to look for any unique characteristics that show up on my screen. I then move my cursor and save those spots in my GPS. is based off of fishing the two different areas of the pads, the area that is in the midst of the pad field and then the edge of pads. both on the edge and in the pads are a swimming jig and flipping a Texas-rigged soft plastic creature bait. The swim jig is nice because it can be fished on top up the pads and then dropped off the edge; I prefer a ¼ oz. jig in a bluegill pattern for this. A wide variety of tail colors can be used and, in my opinion, one needs to experiment with tail colors until the bass tell you what they want. Some of my favorites are white, pearl blue, salt and pepper and chartreuse. 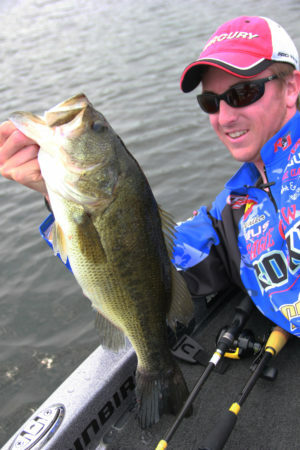 to fish the edge of the pads is with a topwater lure, like a buzzbait. 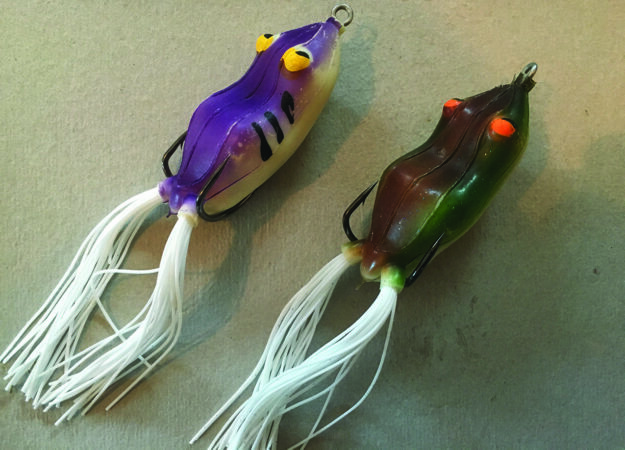 You can cast this lure parallel to the cover, or into the open water pockets and then retrieve it to the boat and with a buzzbait it is easy to keep out of the vegetation by speeding up your retrieve, many times this will invoke a reactionary strike from the bass.